In Shortcuts beta 2.0, HomeKit compatibility is seemingly restricted to contextual Siri Suggestions in iOS 12 beta 6, which saw release earlier this week. Developers testing Shortcuts on devices running iOS 12 can find the new HomeKit actions under Siri Suggestions, a standalone workflow category, or by entering "Home" into the action search bar. It appears that Siri Suggestions, and not the Home app, is powering current HomeKit integration, as search results return Home app actions under "Siri Suggestions." For now, Siri Suggestions seems to be pulling in custom HomeKit scenes, or customizable macros that string together commands for multiple smart home appliances. AppleInsider was able to confirm HomeKit integration in Shortcuts, though restrictions to Siri Suggestions makes the process of surfacing actions quite cumbersome. Instead of viewing a list of available HomeKit actions directly in Shortcuts, users must first trigger a desired scene in the Home app, return to Shortcuts and access the command via Siri Suggestions. Along with HomeKit, the 2.0 release of Shortcuts builds on Apple's initial beta release early last month with bug fixes and other minor system improvements. 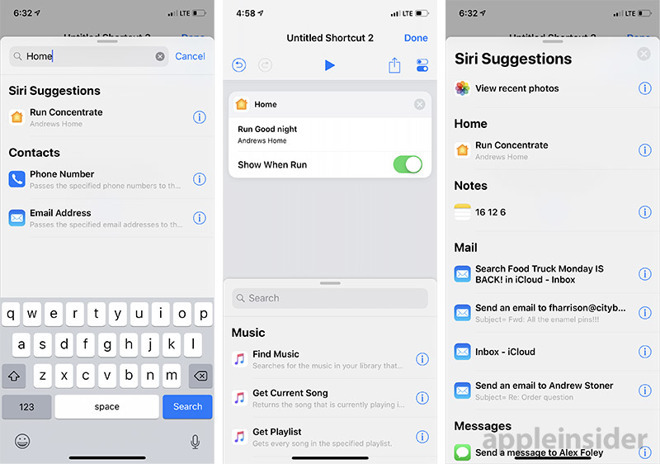 Debuted at WWDC 2018, Shortcuts is a highlight iOS 12 feature that allows users to create and run app macros via custom Siri phrases. For example, an iPhone user can create a shortcut called "I lost my keys" that automatically pings a connected Bluetooth-enabled Tile tracker.